I knew exactly what I was doing when I applied to graduate school in English during my senior year of college. First, I wanted to get my letters of reference squared away before my advisors forgot me. Not that I would blame them for doing so. Professors are busy people who are always being asked for references. They’re bound to get people mixed up at some point. I also wanted to get the testing over with. I took the GRE and the LSAT at the same time while I was in a studying mood. Sure, if I had taken a year off, my writing sample would have been much better. I know my statement of purpose would have been better. But it’s hard to argue with momentum. I didn’t want to go to grad school because I had hazy aspirations of a sheltered life in the academy. I wanted to get a job and move somewhere new. I had the test scores, the papers, the references, and a few years of tutoring under my belt. It made sense to go to grad school in English, not to go to some random city where I didn’t have a job and flounder a while until I found myself. My undergrad advisors had warned me the job market was tough. They warned me not to stay in the same place where I did undergrad. One of them even told me straight-up not to go if I didn’t get funding. That advice was a real jolt, but it was the best advice I ever got. A program accepted me, I got funding, and I started my MA in the fall. The point of all this? Undergrads are not necessarily lost if they tell you that they want to go to grad school. Many of them have thought out a plan. Many of them have back-up plans. Just tell them the truth about the market, the funding, the job prospects, and the placements–especially the placements. If you tell the truth and they go anyway, they can’t blame you if they don’t get a job in the end. I sure don’t blame my undergrad advisors for the fact that I decided I didn’t want to be a professor after all. 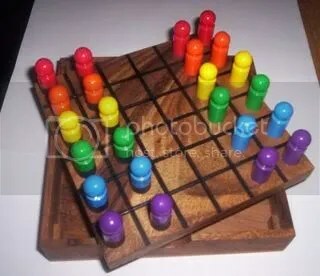 An image of the game Irides, an abstract strategy game designed by J.C.Tsistinas. Image from Wikimedia Commons under a Creative Commons license.